Computex, hosted every year in Taipei, is one of the world’s largest consumer electronics shows. This year, Intel is using the conference as a platform for launching its fourth generation of Core processors, code-named Haswell , which is already appearing in desktops like the Falcon Northwest Fragbox that we reviewed a few days ago. The new architecture is built on Intel’s cutting-edge 22nm tri-gate fabrication processor, and the company hopes it will bring Core processors into even smaller and more portable systems. Here’s what you can expect from the next generation in performance, portability, and price. If you hear a subtle tick-tock on a quiet night, don’t bother checking the clock.The noise is probably Intel’s relentless push forward, known as “tick-tock ,” which demands rhythmic updates of the company’s processor architecture and manufacturing process. This year is a “tock” year, which means the new 4th-genprocessors, code-named Haswell, will be built on a new architecture. Though the “tock” part of the Intel roadmap is a new architecture, what makes for a new architecture is fuzzy. “New” architectures are often just heavily revised, and that’s certainly the case with Haswell. Many changes focus on giving the processors more, which includes improving everything from cache bandwidth to branch prediction – both of which save the processor time, which results in a a speedier user experience. As you’d expect, the 4th-gen Core processors are quicker. Though Intel claims a 15 percent improvement, our hands-on experience thus far suggests the improvement is between 5 percent and 10 percent. That’s not mind-blowing, and casual users may not notice much difference between 4th-gen Core processors and the preceding generation. Intel also has no plan to introduce a six-core version at this time, which means Intel’s fastest processor will still be the Core i7-3900 series, a trio of processors based off the aging Sandy Bridge architecture. 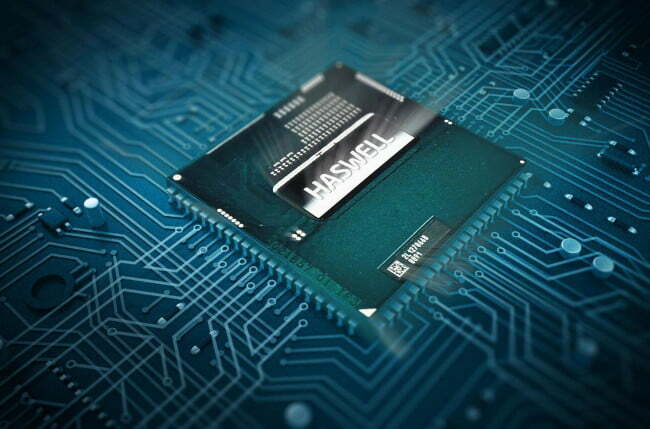 Performance gains are modest because Haswell’s focus is on efficiency. Though standard desktop parts are unlikely to see major reductions, new mobileprocessors for Ultrabooks are promised to offer up to 9 hours of battery life and standby time of up to thirteen days. This will be possible through new low-voltage parts with a thermal design power (TDP) as low as 6 watts. That beats Intel’s original target of 7 watts, which was announced at CES 2013. Efficiency is also improved through two new low-power states that help Haswell use up to fifty percent less power at idle and standby than the previous generation. The 6-watt TDP is significant because current Intel Core processors, even those meant for Ultrabooks, use too much power to fit comfortably in the smallest convertible laptops . That forced manufacturers to rely on Intel’s older, slower Atom processor line. Intel says that we’ll see the fruits of its labor appear in the latter half of 2013 as manufacturers bring over 50 new convertible and “2-on-1″ tablet/laptop hybrids to market. Intel’s new integrated graphics processor is arguably the new architecture’s crown jewel. Intel considered it important enough to reveal Haswell’s lineup of IGPs a full month before the 4th-gen processors debuted. 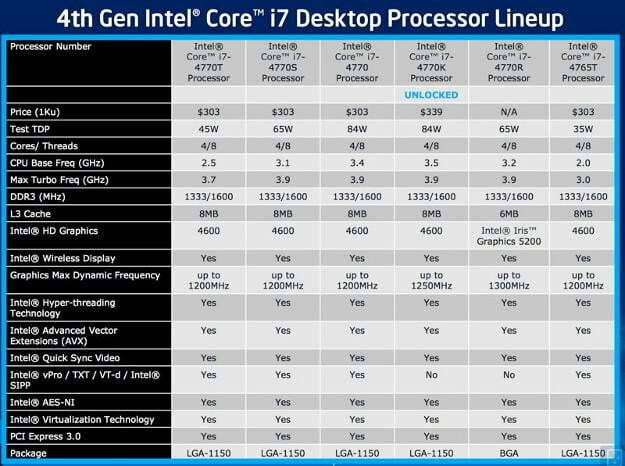 Unlike previous versions of Core, which came in two numbered versions of Intel HD Graphics,the IGP on Haswell will be divided into several different lines : HD Graphics, Iris, and Iris Pro. While Intel talked most about Iris and Iris Pro, it’s most powerful integrated graphics processors, the majority of Haswell processors will ship with a less powerful HD graphics processor. Most desktops and laptops with standard dual and quad-core processors will receive Intel HD 4600. We tested HD4600alongside a Core i7-4770K processor and found it to be approximately 39 percent quicker than HD 4000 in games – an improvement that makes Skyrimand Battlefield 3 enjoyable at medium detail and 1366 x 768 resolution. Many mobile systems won’t enjoy this improvement, however, because all of the company’s low-wattage Y-series, and most of the U-series processors, will ship with Intel HD 4400 or 4200 instead. These slower IGPs, which we’ve yet to test, have the same number of execution units as HD 4600 but will achieve lower clock speeds. The exact details vary from processor to processor. Intel’s high-end offering is the HD 5000 series, better known as Iris and Iris Pro.These IGPs are architecturally the same as the HD 4000 series, but the number of execution units is doubled to 40 and the IGP’s clock can reach up to 1300 MHz. Iris Pro goes even further by including a 128MB eDRAM cache which helps Intel deal with the memory bandwidth problems integrated graphics processors have traditionally faced. The raw power of Iris Pro is over 800 GFLOPs, more than Nvidia’s GT 650M. Availability will be limited, however, as Iris and Iris Pro are only planned for select desktop and mobile processors in the H, M, and U series, and Iris is listed as optional with the latter two. Of the parts confirmed so far, only three offer Iris: the Core i7-4770R for desktop, and a pair of mobile quads, the Core i7-4950HQ and 4850HQ. Though more are likely to arrive as the lineup is fleshed out, Iris is clearly the exception rather than the rule. The original Ultrabook design concept was Intel’s attempt to force the industry into accepting ultra-thin laptops. 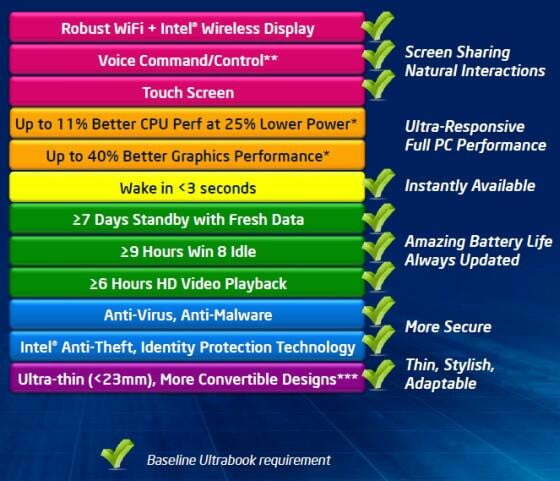 The gambit worked, so Intel is trying the same trick again by making touch mandatory for all Ultrabooks. Every Ultrabook that uses a 4th-gen processor must have a touchscreen to qualify for the label.There’s pros and cons to this approach: the demand should inspire innovative design, but it may force touch into systems that don’t need it. Touch isn’t the only input that’s receiving attention. Intel’s push for “perceptual computing” continues and has resulted in Intel making the platform “hardware-ready” for voice recognition. Other improvements include an authentication chip that can combat identity theft, the ability to receive updates and notifications while on standby, and instant-on functionality that can boot to Windows in as little as three seconds. Desktop users shouldn’t expect a revolution. Intel’s new processors are faster and more efficient, but these improvements don’t change the market’s terrain.Traditional PCs, and even some new categories like all-in-ones, will be sold as they were before. Users can expect to see a modest boost in graphics performance across the line, but even this won’t be as dramatic as was originally expected because Intel’s big guns will only be found in a small number of processors sold. Most consumers will end up with Intel’s more mundane HD 4600. Laptops, Ultrabooks, and convertibles will see more dramatic change. At CES 2013, Intel showed a concept hybrid laptop that promised 13 hours of battery life yet used a 4th-gen Core processor (currently, only convertibles with Intel Atom have a hope of achieving that figure). That prototype will never be sold, but it shows the kind of system we can hope to see come to consumers this holiday season. 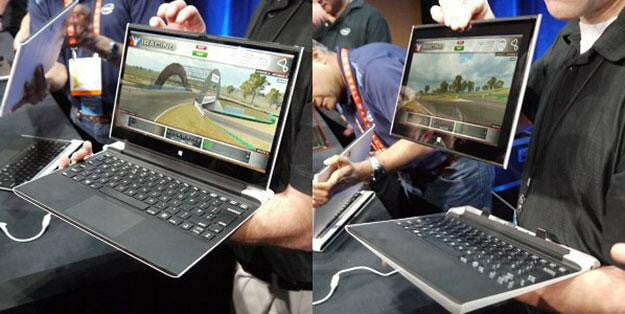 Mobile systems with Haswell will be lighter, thinner, and more portable than ever before. 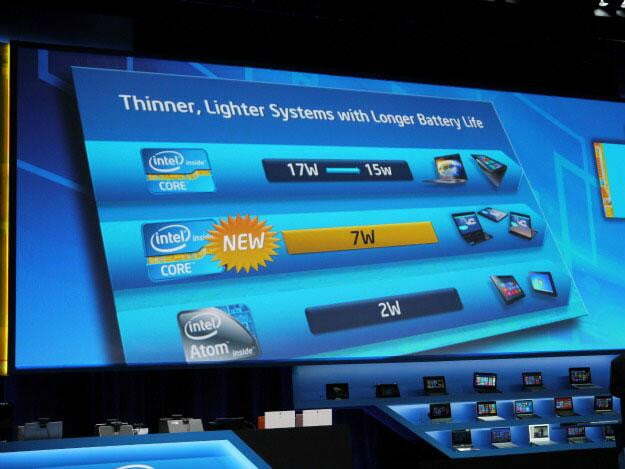 Intel has confirmed Haswell’s launch is focused on quad-core parts for desktop and mobile. Dual-core components will come later, and while no specific date has been given, we’ll likely see them within one to two months. If that proves correct, numerous computers (including Chromebooks and MacBooks ) will be refreshed in time for back-to-school shopping. The arrival of the new generation should also lead to a clearance on systems with 3rd-gen processors, so keep an eye out for deals on late-model desktops and laptops.